For full list of changes, please go to the official release notes. To update the program simply download the latest version from CodeTwo website and install it on top of the existing installation. All your licensing data and program’s settings will remain unchanged. 1> The information in this e-mail or attachments thereto is intended for the attention and use of the addressee only. 2> If you are not the intended addressee/recipient, you are hereby notified that any disclosure, copying or distribution of the contents of this email transmission or the taking of any action in reliance thereon or pursuant thereto, is strictly prohibited. 3> Should you have received this e-mail in error, please delete and destroy it and any attachments thereto immediately. 4> At no time may you act on the information contained therein. The use of “or” in (1) means that I can elect to apply the sender’s intent to either the content OR the attachment. Furthermore stating an intent places no obligation, implied or explicit, on myself as intended recipient, or acquirer in any other way. (2) has a major flaw, if I AM the intended recipient none of it applies to me. I can distribute it or take an action on it with no concern of this point. And if I forward it to someone else, then they become the intended recipient to whom I send it, they are not bound by it either. (3) “Please” conveys no sense of obligation or duty. And my company has to abide by a protection of information act which states that all emails are archived for a minimum of five years (in fact they will be stored for as long as the IT backup process is maintained). (4) This is ridiculous, most emails contain information which requires one to act in some way or other. (5) I wonder if stating that the disclaimer is added automatically renders it invalid. When I send emails from my company address, the disclaimer is added as it leaves the mail application – I do not see it in the Sent Items version of the email, only once the email is replied to. So the sender is unaware of the conditions of the disclaimer. I wonder if any disclaimer that does not require any positive, and provable, form of acceptance by the disclaimee (party on whom the conditions apply) is legally valid. Signboards that indicate “By entering these premises the visitor agrees to have accepted these conditions” must surely be unenforceable. Silence is never assent in my experience of the law. 1. and 2. – these points might actually be improved, e.g. by replacing “or” with “and” in 1. 3. and 4. – the enforceability of confidentiality disclaimers depends on the legislation in the given country. Check out the following article for details: http://www.codetwo.com/blog/law-vs-email-disclaimers-overview-of-existing-international-legislation/. 5. 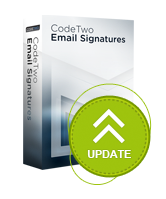 There is a feature called “Sent Items Update” available in the CodeTwo Exchange Rules software family that adds the disclaimer to the emails in the Sent Items folder too so the user can see it.